To become eligible for the trainee driving instructor licence, ADI Part 1 and ADI Part 2 of the Approved Driving Instructor (ADI) qualifications will need to be successfully completed. A driving school will be needed in order to sponsor you plus a minimum of 40 hours of ADI Part 3 training will need to have been completed of which at least 10 hours must be in-car training. A trainee driving instructor licence can then be applied for. If your application is successful, your licence should arrive within 2 to 3 weeks. This licence will enable you to become a Potential Driving Instructor (PDI) and you are entitled to legally be paid for driving instruction. The trainee licence is valid for a maximum of 6 months and currently costs £140.00. 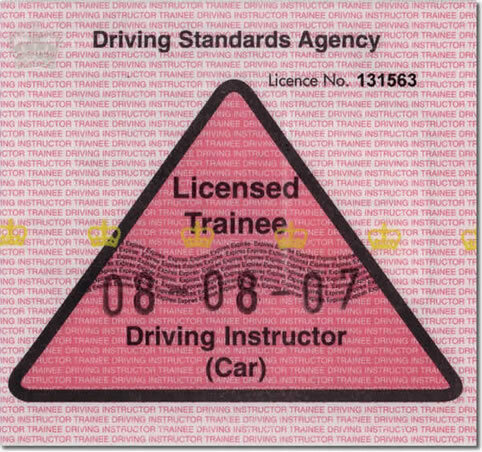 Generally only one trainee licence is permitted per individual although in certain circumstances a second can be granted. For an example, if your Part 3 test has been cancelled by the DVSA and your trainee licence expires before the date the DVSA has arranged your new Part 3 test, then a second trainee licence would likely be granted if applied for. To obtain your trainee licence, you must be sponsored and work with an established driving school such as Cambridge Driving School. The school must have a fully qualified driving instructor (ADI) for each trainee sponsored. As a trainee licence holder, it is required that you receive an additional 20 hours of Part 3 training. 5 of these hours must be practical in-car training. This additional training must be conducted within the first 3 months of the trainee licence or if sooner, prior to taking the Part 3 test. It is not essential to have a trainee licence for Part 3 preparation. The experience and skills gained whilst on a trainee licence however can be for some a significant advantage. Your trainer will discuss with you the benefits that you as an individual may gain from a trainee licence and if it is deemed appropriate in your particular case. Instruction is only to be give under the school whose address is shown on the licence. You are not permitted to advertise yourself as a fully qualified driving instructor. Before applying for a trainee licence at least 40 hours of Part 3 training must have been completed with at least 10 of these being practical in-car training. In- car training must be conducted either on a 1 to 1 basis with your trainer or 2 to 1. It is your responsibility to receive the appropriate training in the specified subject areas. Form Instructor Training Declaration ADI 21T must be signed by the sponsoring school and submitted alongside your trainee licence application form. Once you have met these conditions and apply for your trainee licence, you will be presented with 2 options. These options need to be considered carefully as the chosen option cannot be changed once your application has been received. Your sponsoring trainer / Approved Driving Instructor (ADI) will supervise you for a minimum of 20 percent of all lessons you give. trainer / ADI and returned to the DVSA when your licence expires. A minimum of 20 hours additional training must be taken covering all the topics specified. The training must take place within the first 3 months of your licence or before you take your first attempt at the Part 3 test, whichever comes sooner. A record of this training must be kept on form Instructor Training Declaration ADI 21AT. This completed form must be sent to the DVSA before the end of the 3 month period or presented to your Part 3 examiner, whichever is sooner. Download DVSA form Instructor Training Declaration ADI 21AT PDF file. A minimum or 25 percent training must be practical in-car on a 1 to 1 or 2 to 1 basis with your trainer. Form ADI 21AT must be signed to confirm you have undergone the training. Download the DVSA trainee driving instructor application form ADI 3L PDF file. Along with your trainee driving instructor licence application, form ADI 3L (MD) must be submitted. Form: Application for trainee licence: Declaration of Manager / Owner, this must be signed by the manager or owner of the driving school. Download the DVSA form ADI 3L (MD) Application for trainee licence: Declaration of Manager / Owner PDF file. A minimum of 40 hours of Part 3 training must have been completed (with at least 10 hours practical in-car training) within 6 months of the trainee driving instructor licence application. To certify you have received this training, DVSA form ADI 21T must be submitted. Form: Instructor Training Declaration ADI 21T is for your ADI trainer to sign. Download the DVSA form ADI 21T Instructor Training Declaration PDF file.